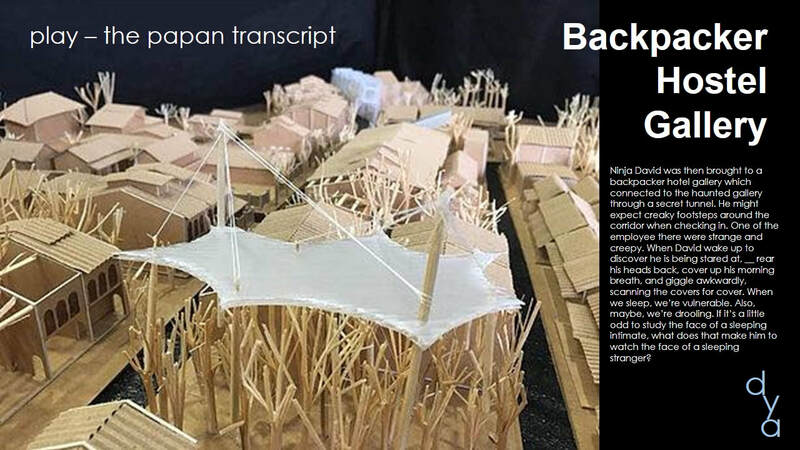 ABSTRACT: This paper is to present the findings employing the modus-operandi of Dialogue-Do-Document (3Ds), as an Architectural Design Pedagogy, with emphasis on using physical model as a basis of architectural production, hereinafter called the Model Based Paradigm (MBP). 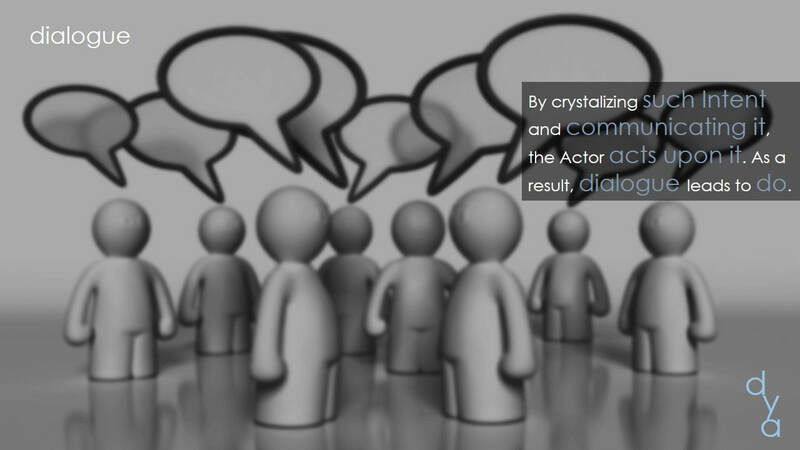 3Ds stem from the assumption that a Dialogue: discourse, must first take place to enable the Idea/Intention to be crystalized, a process called Ideation. 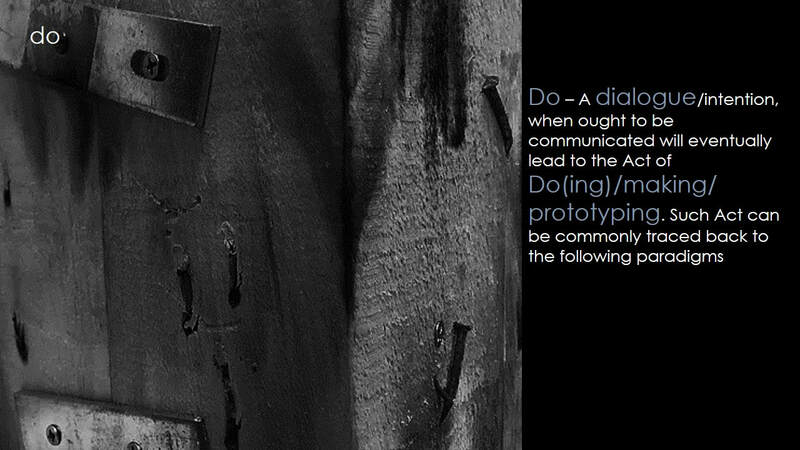 Translating such into action is an act of Do(ing): fabricating/manufacturing/prototyping. When the act is done, we obtained a product, be it a Play: model/drawings/essays, is collectively called a Production Model. When such is Document(ed), it becomes the seed for future dialogue to take place and this modus-operandi will continue ad-infinitum. 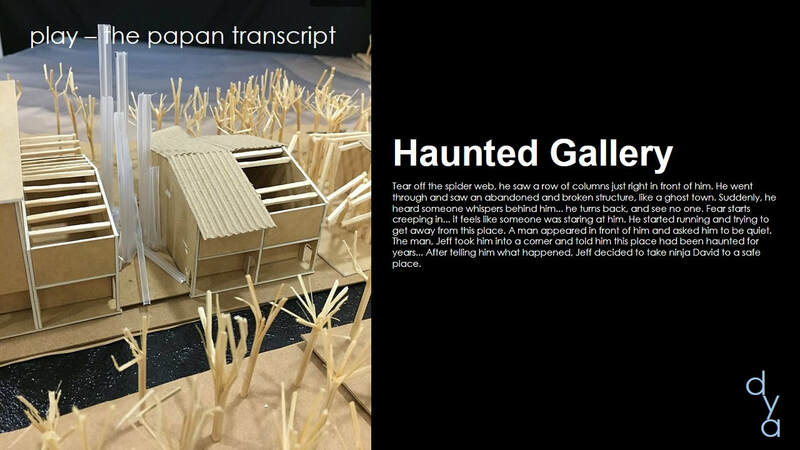 An experimental testbed of Design Discourse in Sem-3; began with an architectural installation based on a narration; follow by a site intervention, called the Papan-Transcripts; and concluded by the design of Galleries. 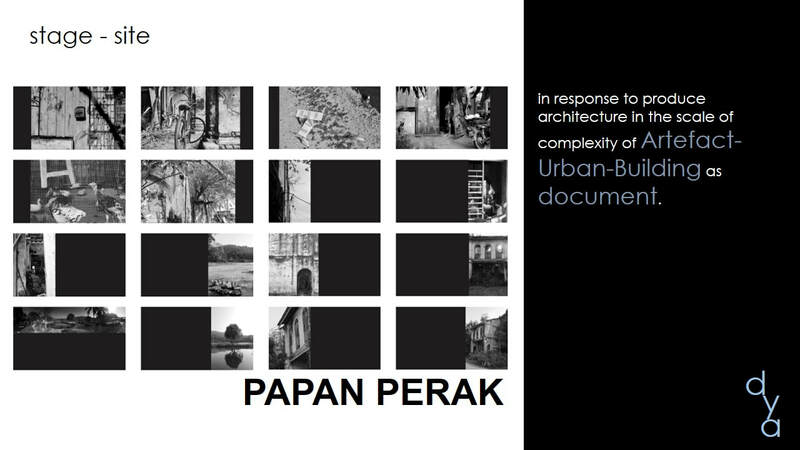 Each of these discourses, emphasis is given to Model Based Paradigm as a basis of architectural production; while others draw, we build; confronting function follow form; exploring context versus pretext; employing urban design and transitional spatial organizations. 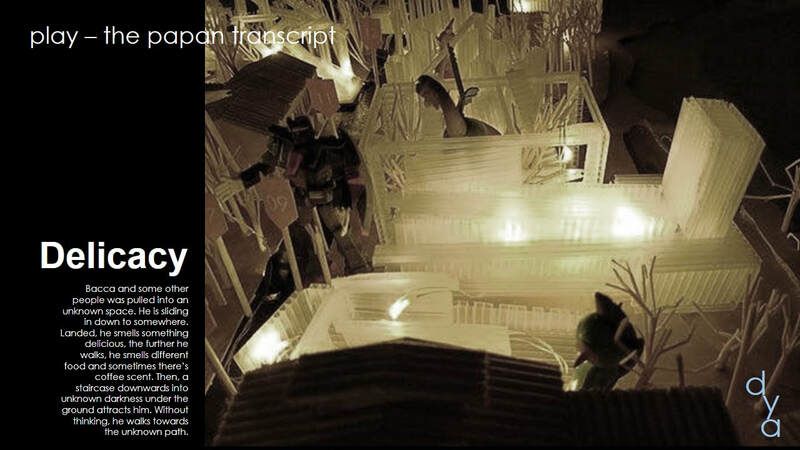 Key findings revealed that employing Model Based Paradigm, the Actors understood; Architectural Semiotics beyond mere representation; Urban Design where every building has its place; architecture solution versus interior/landscape solutions; design strategy of forms dictate spaces; transitional space planning; self and its personas; as in teamwork and the fundamental of design that stems from having fun. 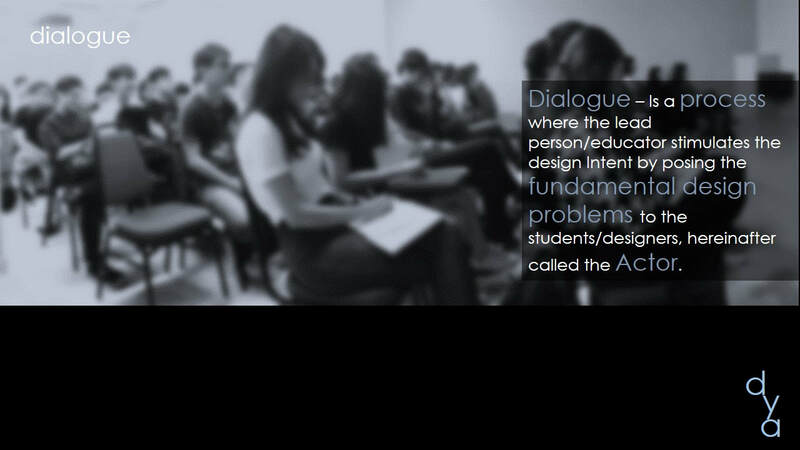 Dialogue – Is a process where the lead person/educator stimulates the design Intent by posing the fundamental design problems to the students/designers, hereinafter called the Actor. Such act of questions and answers spur dialogue. 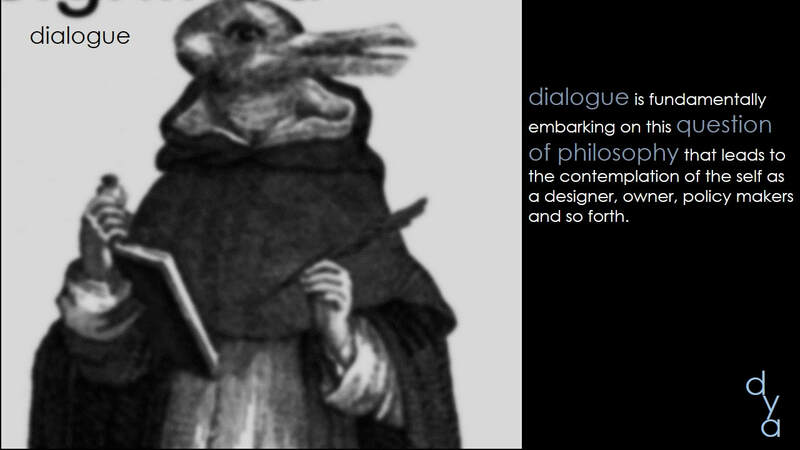 Such dialogue is fundamentally a subject of philosophy. Embarking on this question of philosophy leads to the contemplation of the self as a designer, owner, policy makers and so forth. By crystalizing such Intent and communicating it, the Actor acts upon it. As a result, dialogue leads to do. 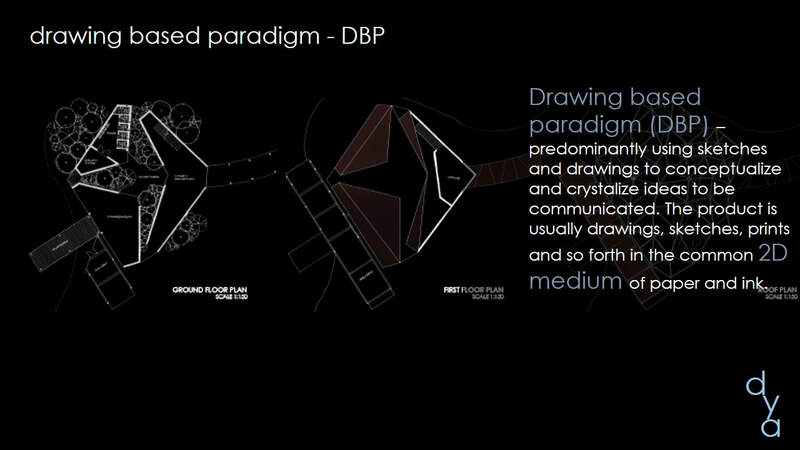 Drawing based paradigm (DBP) – predominantly using sketches and drawings to conceptualize and crystalize ideas to be communicated. The product is usually drawings, sketches, prints and so forth in the common 2D medium of paper and ink. 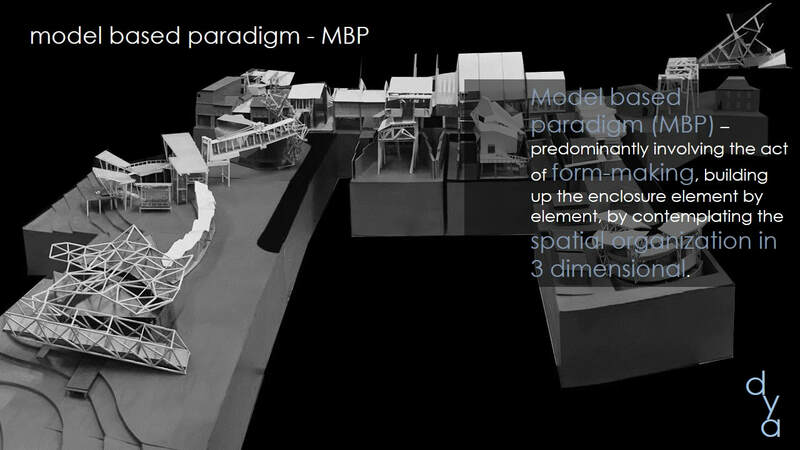 Model based paradigm (MBP) – predominantly involving the act of form-making, building up the enclosure element by element, by contemplating the spatial organization in 3 dimensional. 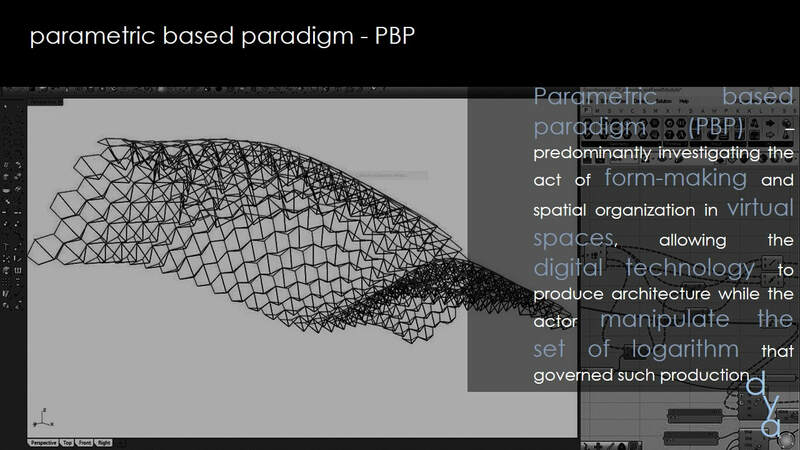 Parametric based paradigm (PBP) – predominantly investigating the act of form-making and spatial organization in virtual spaces, allowing the digital technology to produce architecture while the actor manipulate the set of logarithm that governed such production. 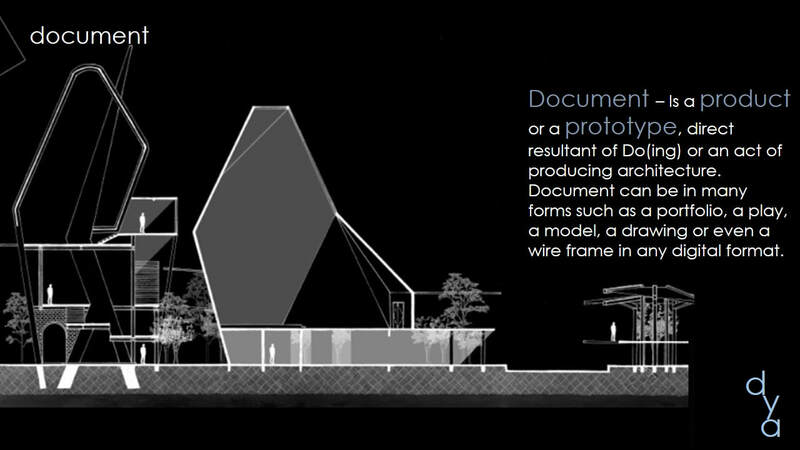 Document – Is a product or a prototype, direct resultant of Do(ing) or an act of producing architecture. Document can be in many forms such as a portfolio, a play, a model, a drawing or even a wire frame in any digital format. 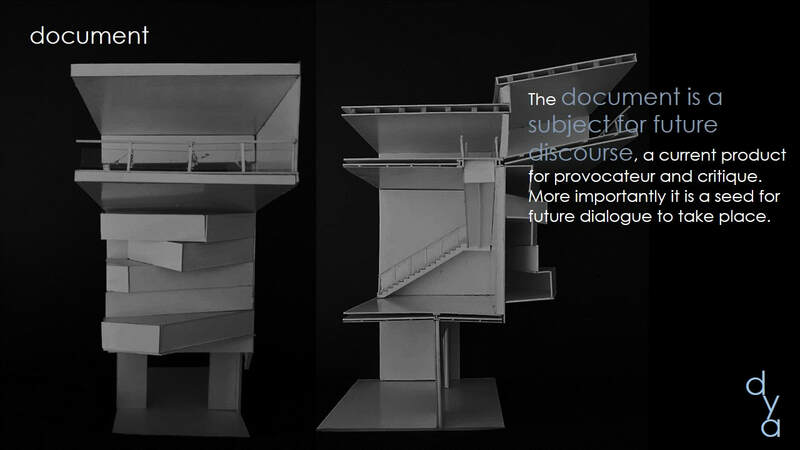 The document is a subject for future discourse, a current product for provocateur and critique. More importantly it is a seed for future dialogue to take place. Collectively, no matter how diverse our approaches are, in embarking the design studio, the underlying Production Model where the 3Ds modus-operandi of Dialogue-Do-Documents or Actor-Act-Product prevailed. 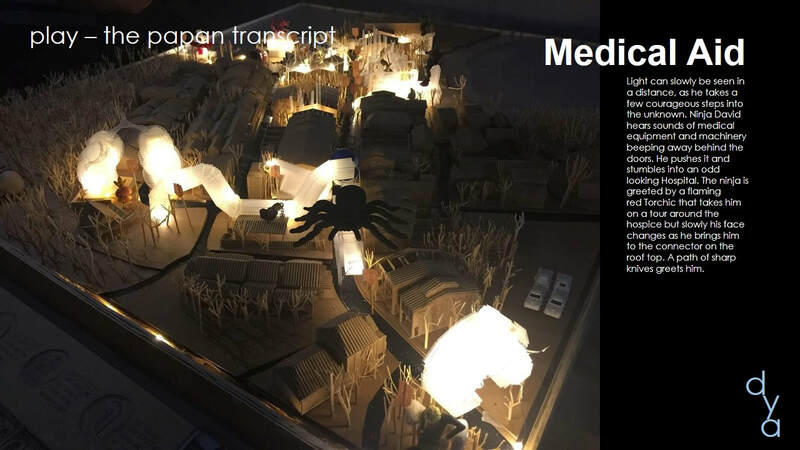 This paper is to present the findings employing the modus-operandi of Dialogue-Do-Document (3Ds), as an Architectural Design Pedagogy, with emphasis on using physical model as a basis of architectural production, hereinafter called the Model Based Paradigm (MBP). [i] Salama, A. 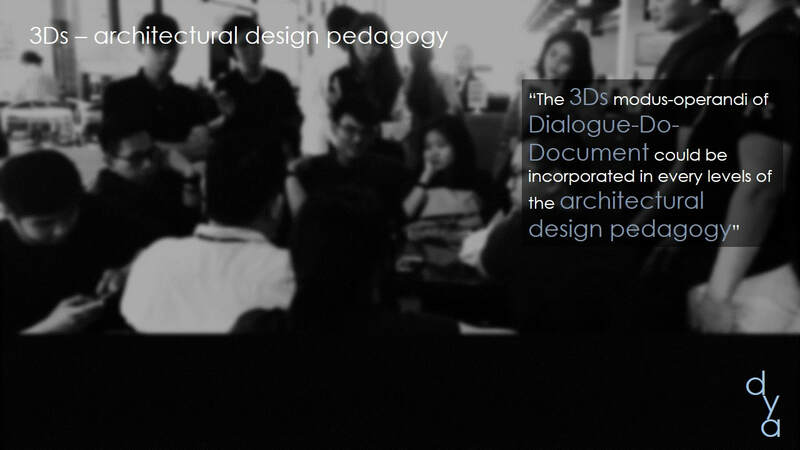 “Design Studio Teaching Practices: Between traditional, revolutionary, and virtual models”. College of Environmental Design King Fahd University of Petroleum and Minerals- KFUPM - Dhahran, Saudi Arabia. 2006. 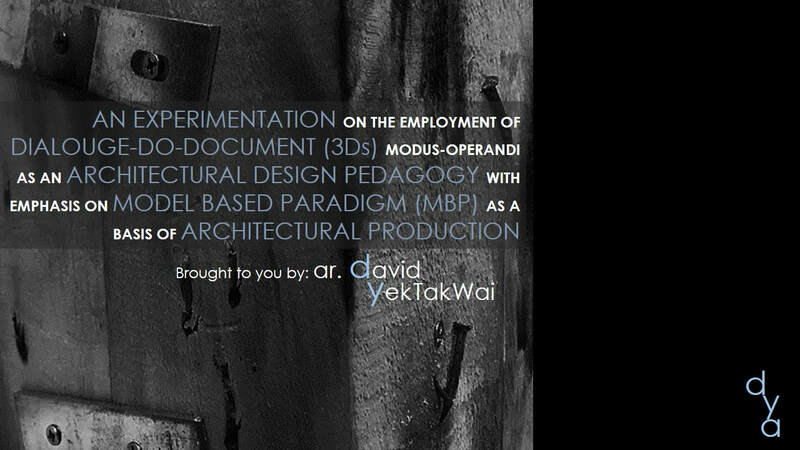 Model Based Paradigm (MBP) as a methodology required a design vehicle that was annexed to the Design Discourse in Sem-3 (in UCSI) as an experimental testbed that called for an architectural intervention of a place called, Papan in the state of Perak, Malaysia, based upon a historical account of Sybil Kathigasu’s book ‘No Dram of Mercy’ as its narration. Its site context; and often its place in history. Editing the message into a simple theme and then expanding it into a complete story creates the fullness of the experience. Materiality, structure, form and detail become the vehicles to impart the message(s). 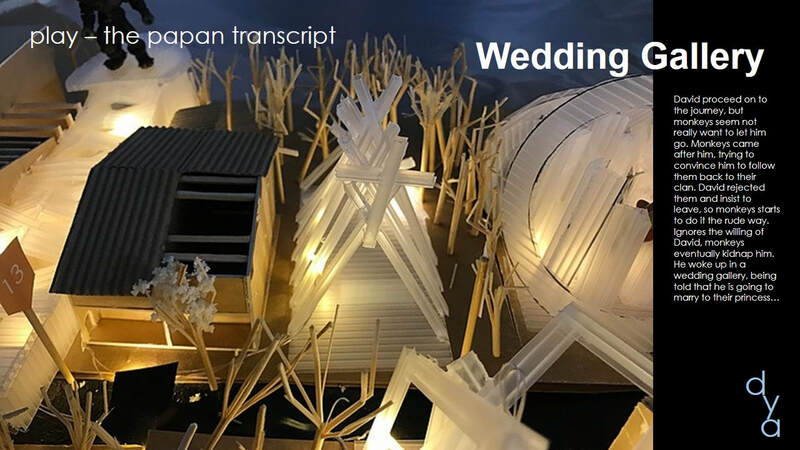 A descriptive installation – where each actor is challenged to translate a story from Sybil Kathigasu’s ‘No Dram of Mercy’[ii] into a descriptive installation. Actors are encouraged to ‘craft’ the artwork with all kinds of material/elements that could help describe the story, according to their very own understanding. 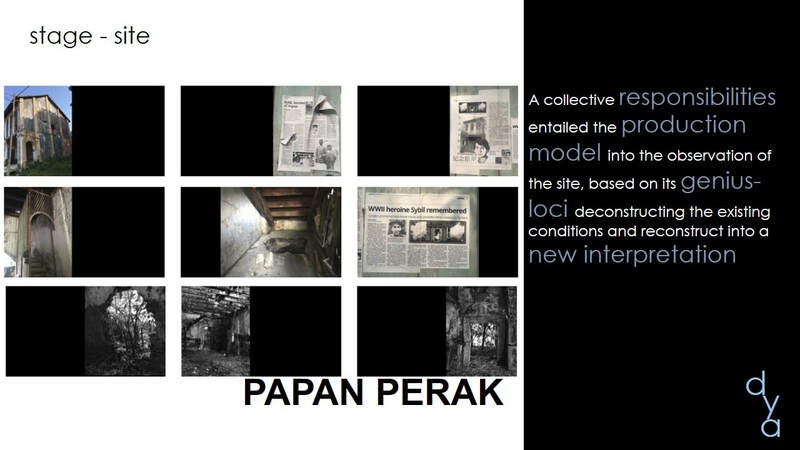 An approach to site intervention – where the actors were brought to the site in Papan, Perak for site investigation, ultimately urged to conceive, re-interpret the approach to intervene the site in the form of architecture intervention. 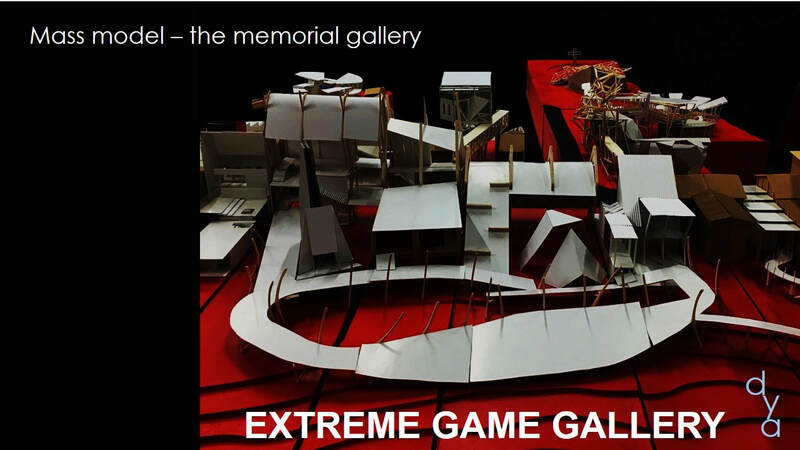 A design of a Gallery in Memory of Sybil Kathigasu – where the actors were challenged to re define the very notion of a gallery and a memorial and to place their architectural product against the site intervention they had done earlier. Embarking on such brief and the design vehicle, one can easily apply the notion of the Production Model, now taking the trinity of the Actor-Act-Play. [i] CheeKeong Teoh, “Semester 3 B.Arch.Stud. 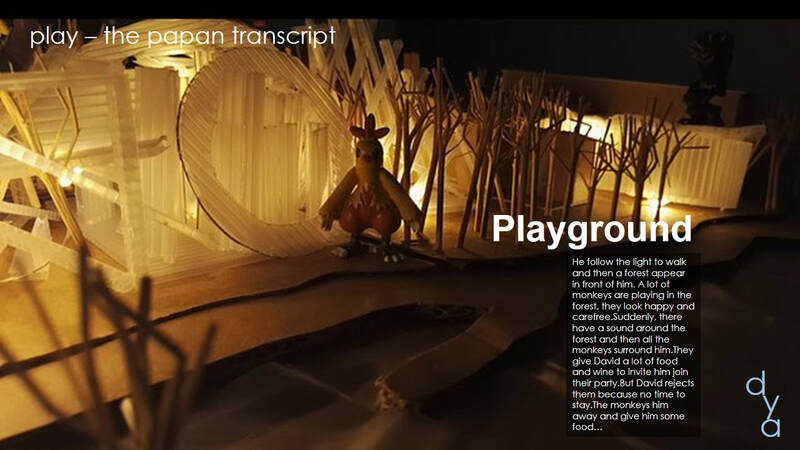 Design Studio Brief – Sybil Kathigasu Narrative Architecture”. UCSI (2018), read http://www.davidyek.com/dkon-4.html, acceded 6 July 2018. 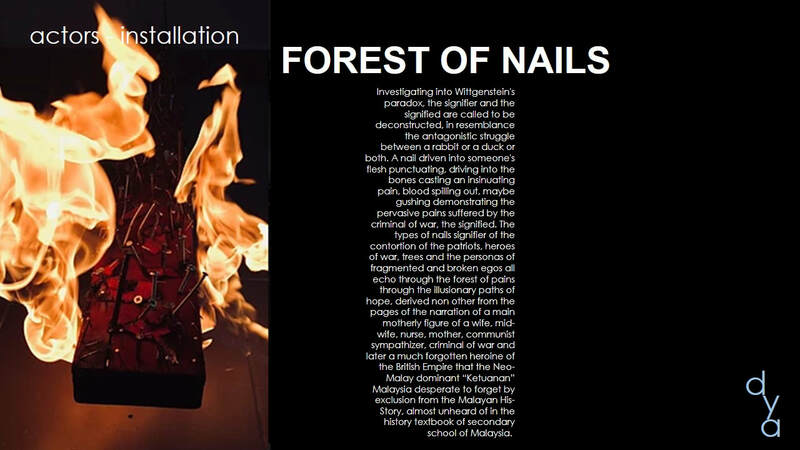 [ii] A book narrating the unfinished first-person account of the experiences of a Malayan woman whose attempts to assist her compatriots during World War II resulted in her imprisonment and death. Sybil Kathigasu. “No Dram of Mercy” (2006), Prometheus Enterprise. 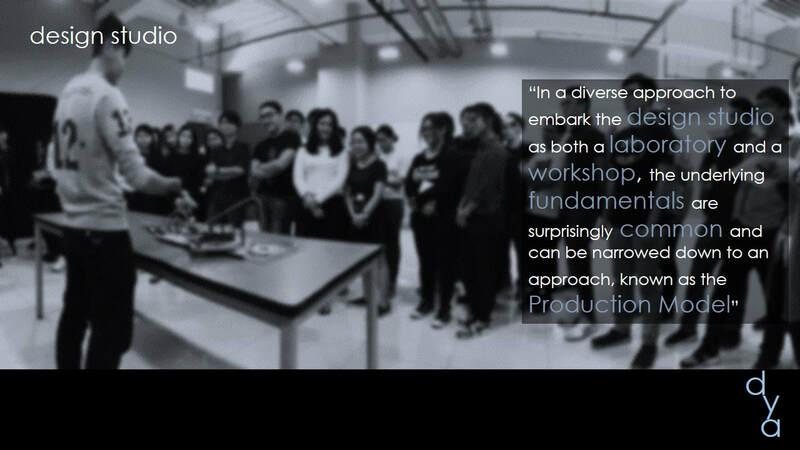 For the studio to exist, there must be the actors, in this instances, the students and the studio master. The actors must first, understood, who they are? Second, as to why they exist? At this point of the dialogue, they contemplated on the questions of philosophy in existentialism – ‘I think, therefore I am[i]’. Further to this, they began to contemplate of their places in space time, as the question goes, ‘why I am here, not there?’, ‘what made me here, and not there?’, ‘what roles am I to play and serve?’ and these are all the questions molding them into understanding the designs they will be designing for. 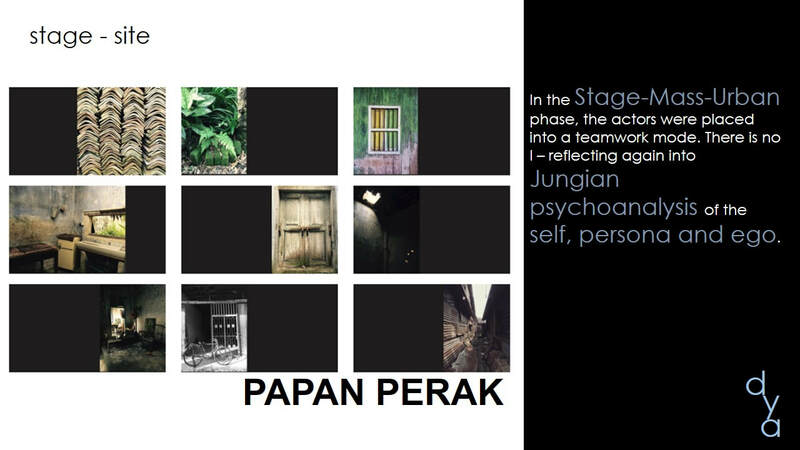 The actor took a piece from the subject of Jungian psychoanalysis[ii] determination into the idea of the Ego, Persona and the Self, subjugated into the idea of Noia, Paranoia and End-noia enabling architecture liked defensible spaces[iii], proximities and finding lost space[iv] to take form. Moving on, the actors attempted to act upon the descriptive installation where each actor is challenged to translate a story from Sybil Kathigasu’s ‘No Dram of Mercy’ into an installation. Little was known that the actors attempted to interpret their ideations as arrays of representation such as, blue represents unity, white purity, red bravery, yellow royalty and so forth, very similar as to how our national school teaching pedagogy of the meanings and representation of the Malaysian flag[v]. Such pedagogy was rather artificial and lacked of a deeper understanding of the order of things[vi]. The actors were introduced to the thinking of Deconstruction as explained in Derrida, where an idea – to dismantle the excessive loyalty to any idea, in order to see its truth lying in the opposite. In “de la grammatologie[vii]”, the attempt to deconstruct is in the attempt to understand the construction of its narrative, in this case, reading ‘No Dram of Mercy’. 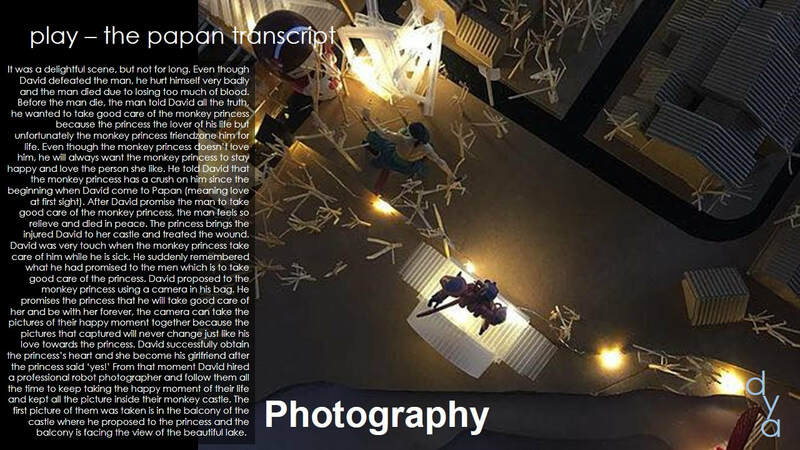 The book itself has its genesis from the typeset yet it is deemed as a transcript from its primary mode – speech. Text itself lacks the authenticity compared to a speech that comprised interactions of the truth through conversation itself – a dialogue. Dismantling such dogmatic narration, example, and speech over writings, reasons over passions, it enables the actors to distill the third force among the rumbles of the untruth. 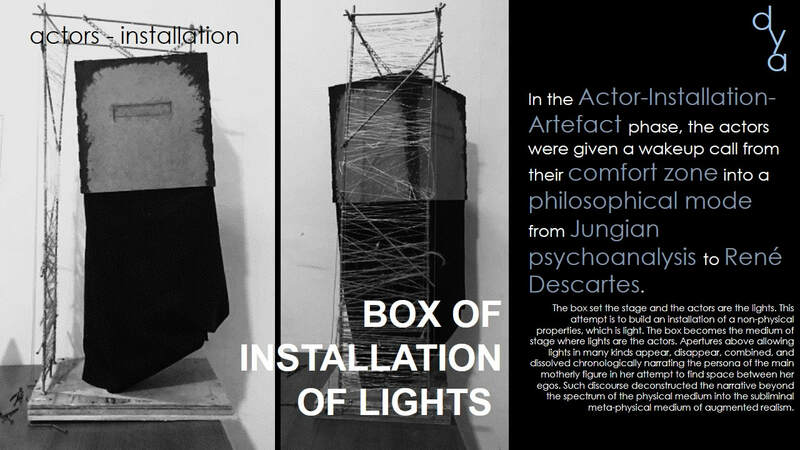 As a result from their very act of do(ing), the installation materialized, as a document/prototype. 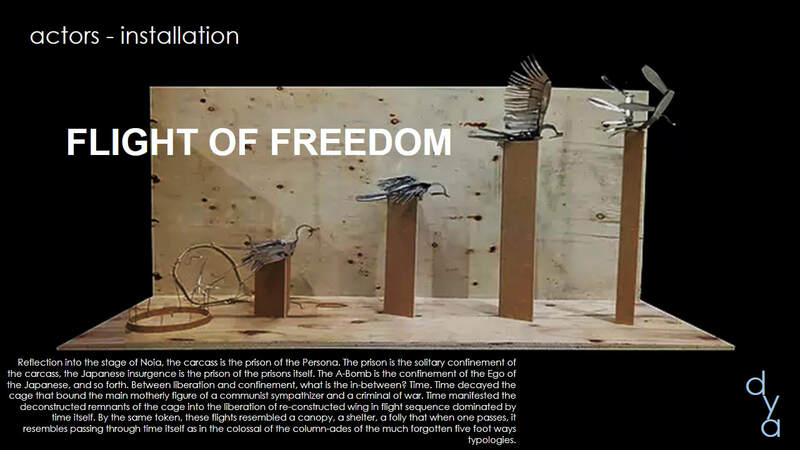 This installation is the very first ideation in a 3D model form, a result of Model based paradigm (MBP) – predominantly involving the act of form-making, building up the enclosure element by element, by contemplating the spatial organization in 3 dimensional. 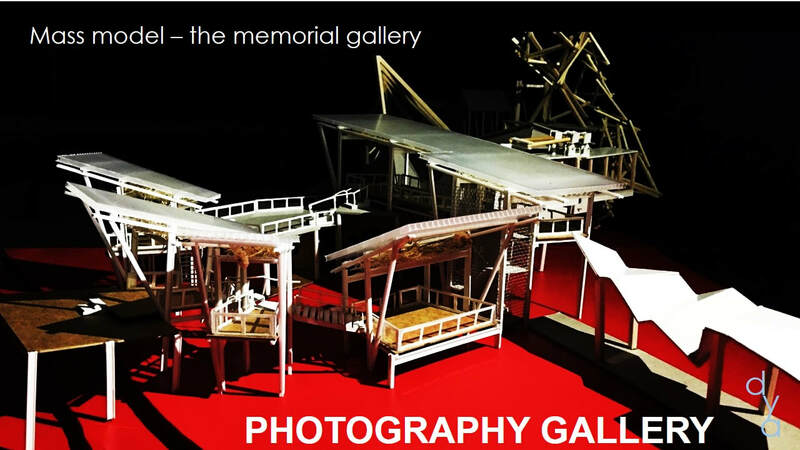 Although there is no specific spatial requirement, such installation remains as follies, as in Tschumi’s Parc de la Villete[viii], where these follies were structure with no apparent usage and reason, besides just a concept, in which the actors had taken at length to understand via Tschumi’s writing, Red is not a Color[ix]. 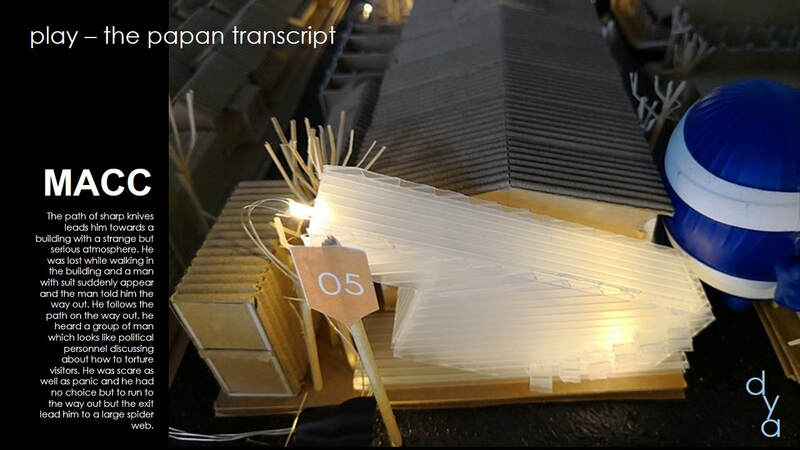 In other words, the installation in this form of document/prototype is the embodiment of concepts/ideation for their future Model of Production. [i] Cogito, ergo sum, René Descartes. “Discourse on the Method” (1637), SMK Books (2009). Also read https://en.wikipedia.org/wiki/Cogito,_ergo_sum, accessed 6 July 2018. [ii] Analytical psychology also known as Jungian psychology. Carl Jung. Read http://en.wikipedia.org/wiki/Analytical_psychology, accessed 6 July 2018. [iii] The defensible space theory encompasses ideas about crime prevention and neighborhood safety. Oscar Newman. “Design Guidelines for Creating Defensible Space” DIANE Publishing (1966). [iv] Roger Trancik. “Finding Lost Space”, John Wiley & Sons Inc (1986). [v] Symbolism and representation of the Malaysian Flag, for details read http://en.wikipedia.org/wiki/Flag_of_Malaysia, accessed 6 July 2018. [vi] Paul-Michel Foucault. “The Order of Things: An Archaeology of the Human Sciences”, Pantheon Books (1970). [vii] Jacques Derrida. “Of Grammatology”, Les Éditions de Minuit (1967). [viii] See https://en.wikipedia.org/wiki/Parc_de_la_Villette, accessed 6 July 2018. [ix] Bernard Tschumi. “Architecture Concepts: Red is Not a Color”, Rizzoly (2012). A portrait is a painting, photograph, sculpture, or other artistic representation of a person, in which the face and its expression is predominant. The intent is to display the likeness, personality, and even the mood of the person. Crucial at this point is the re-construction of a portrait of a main motherly figure of a wife, communist sympathizer, criminal of war and later a much forgotten heroine. These re-construction is further deconstructed by layering the fragments of these features of the portraits by means of different materials manifesting the multiple personas of the heroine in this narrative that appeared to be fragmented, displaced, disjunction, mutilated at one elevation yet come together as a cohesive, seamless, composed portrait at another elevation. 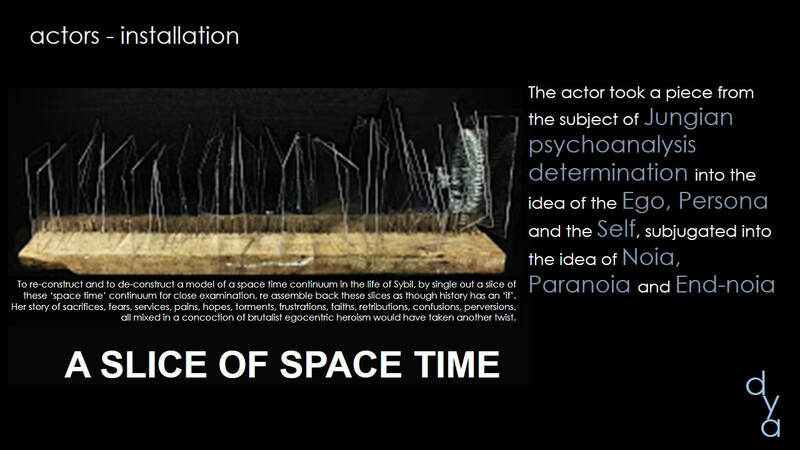 To re-construct and to de-construct a model of a space time continuum in the life of Sybil, by single out a slice of these ‘space time’ continuum for close examination, re assemble back these slices as though history has an ‘if’. Her story of sacrifices, fears, services, pains, hopes, torments, frustrations, faiths, retributions, confusions, perversions, all mixed in a concoction of brutalist egocentric heroism would have taken another twist. The box set the stage and the actors are the lights. 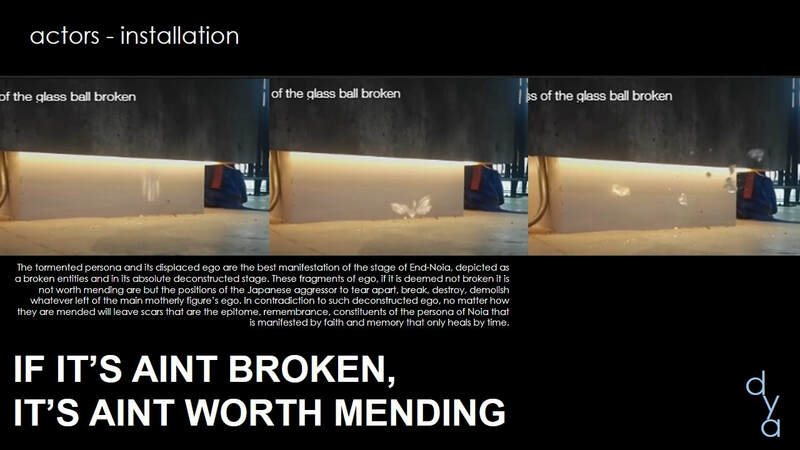 This attempt is to build an installation of a non-physical properties, which is light. The box becomes the medium of stage where lights are the actors. Apertures above allowing lights in many kinds appear, disappear, combined, and dissolved chronologically narrating the persona of the main motherly figure in her attempt to find space between her egos. Such discourse deconstructed the narrative beyond the spectrum of the physical medium into the subliminal meta-physical medium of augmented realism. Revisiting Venturi’s post modernism Complexity and Contradiction in Architecture[i], the notion of signifier and the signified have been given a new twist resemble of Baudrillard’s Hyperreal and the Imaginary from Simulacra to Simulation[ii], often provoking our acceptance of a simulated realities such as Disney and to a certain degree, Flintstone. Such lens are taken to re-examine the Noia of Sybil as to what faith contain within that made of what she was. 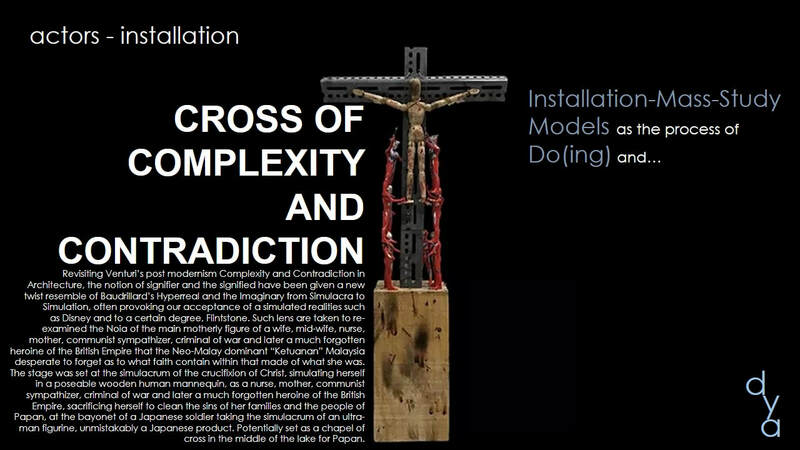 The stage was set at the simulacrum of the crucifixion of Christ, simulating herself in a poseable wooden human mannequin, as a communist sympathizer, criminal of war and later a much forgotten heroine of the British Empire, sacrificing herself to clean the sins of her families and the people of Papan, at the bayonet of a Japanese soldier taking the simulacrum of an ultra-man figurine, unmistakably a Japanese product. Potentially set as a chapel of cross in the middle of the lake for Papan. 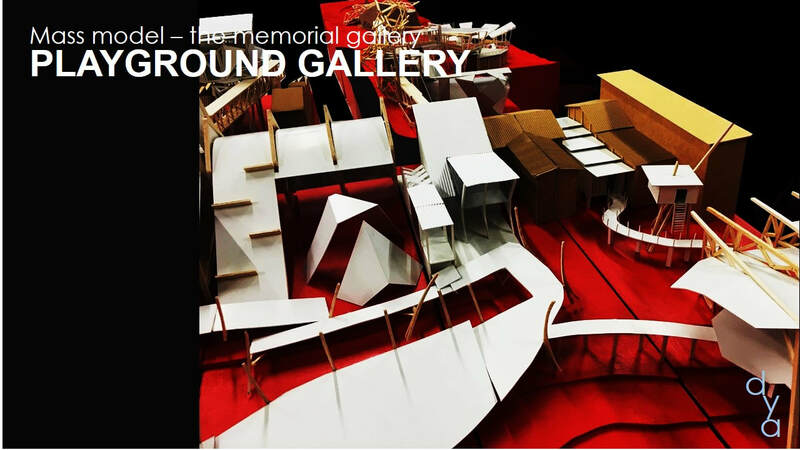 These acts, thematically arranged on the pretext of Para Noia, End Noia and Noia, narrated in the flair of deconstruction against the stage of installation, potentially magnified into follies following the path of Tschumi’s Red is not a Color, collectively resembles the constellations of follies in the suburb of Papan, these were the ideation of the actors, whom they were identified as d:KON4. [i] Robert Venturi. “Complexity and Contradiction in Architecture”, Museum of Modern Art (1966). [ii] Jean Baudrillard. “Simulacra and Simulation”, Stanford University Press (1988). Such act required a stage and is set in Papan[i], Perak. Sleepy Hollow and a Ghostly abode. Forgotten glory of tin mining. Bloody history. 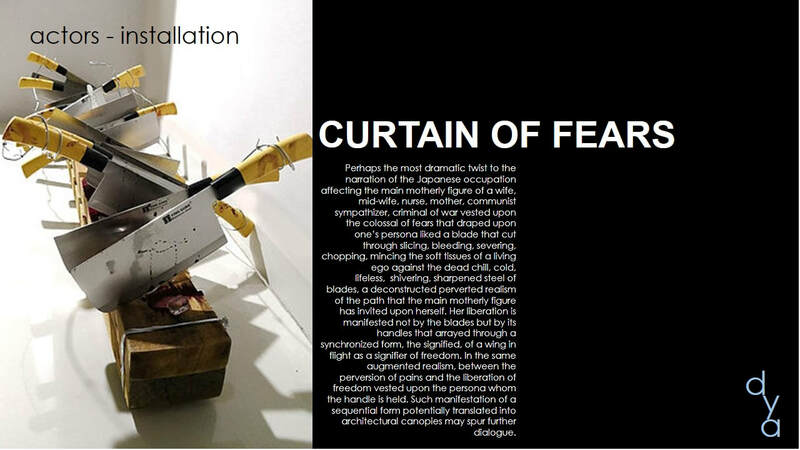 The cradle of a heroic maiden, the government wished to shed, with this manifesto – ‘We, the actor, attempted to intervene with a manifesto of our installation. Each located at the very nook and corner, as our stage. 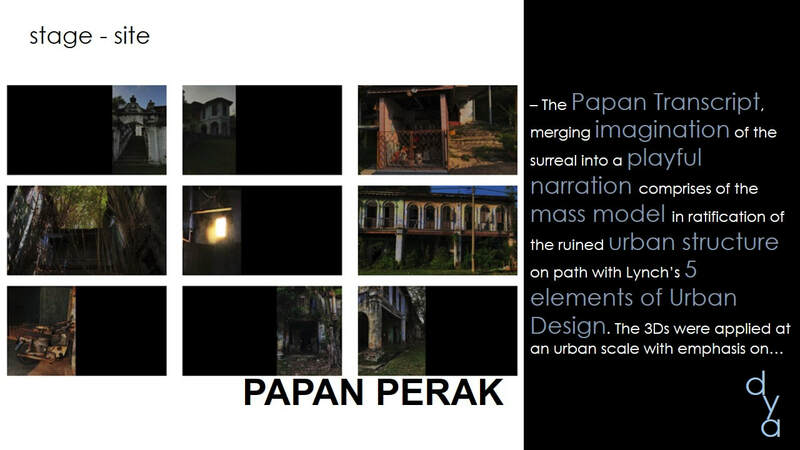 Behold our script, we present to you our play’ and the reconstruction of the site in Papan has taken placed. 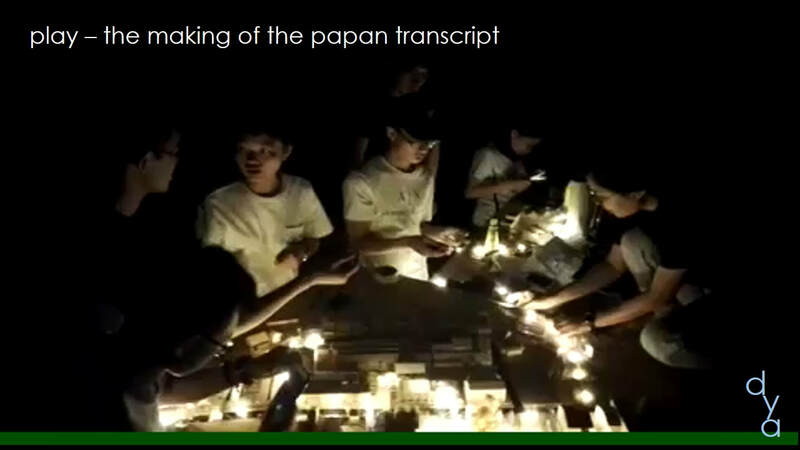 Confronting Papan, the deconstruction design pedagogy took another form of narrative – ‘The Papan Transcript’, a play script narrating fictitious ‘alien’ came to Papan and visit the respective ‘sites’ selected by the actors as their bases to ‘house’ their respective ‘galleries’ or ‘follies’ and the adventures connected therein. 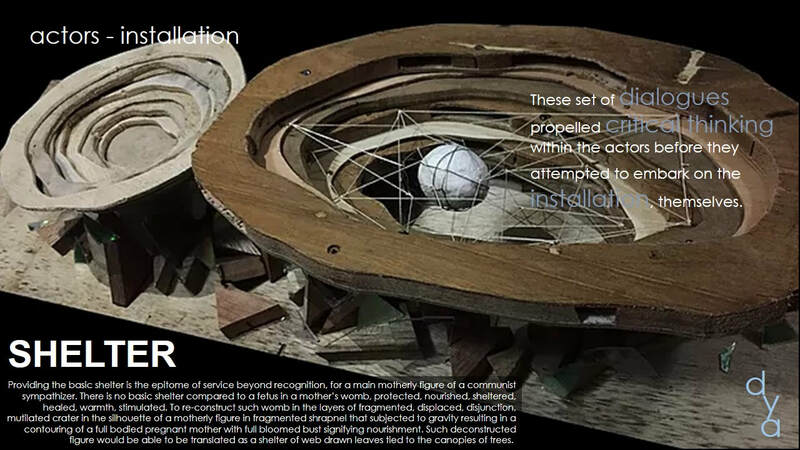 The actors again, employing MBP to insert their respective proposals into the vacant spaces between existing buildings or in some instances, called the interstices of spaces, having linkages to connect one space to another as a continuum of transitional spaces within these constellations. The actors take such intervention as an urban design approach, some having to address the conditions fixed by its ‘brownfield’ nature, while the others, the ‘greenfield’ nature providing limitless and seamless access into the gardens, parks and water bodies. These existing conditions were known as the context, while their intervention – the pretext. The MBP in the forms of massing models, also known as the pretext, allowed the actors to participate in heated arguments, dialogues, discourses, debates and negotiations. Ultimately, these massing models or the pretext shall be seen as constellations, in the absent of the ‘context’. 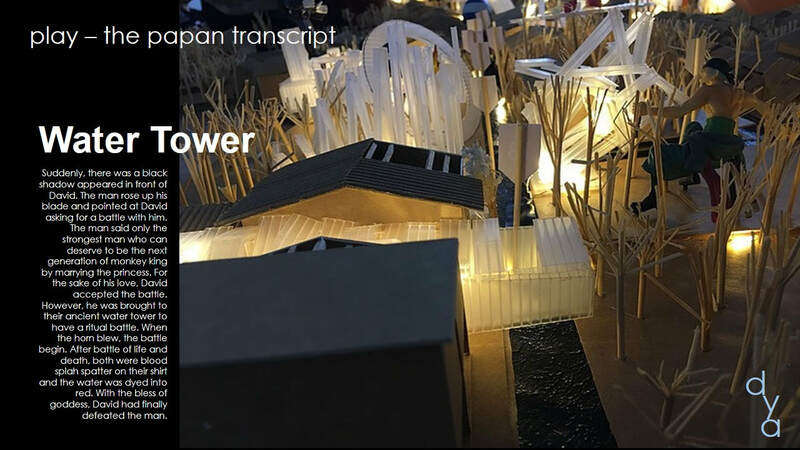 These mass models will be the guiding principles for the actors to design their individual building. [i] Read the background and attraction of this place in http://www.nst.com.my/news/nation/2017/10/293647/forgotten-perak-town-was-backdrop-sybil-kathigasus-heroism, accessed 6 July 2018. With the actors and the stage set, ultimately, these will lead to the play. 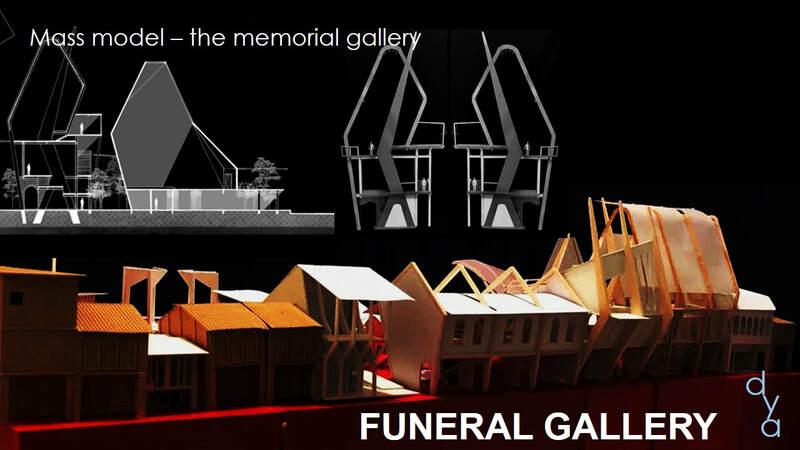 Based on the documented mass model, the dialogues now, centered upon the very notion of memorial and galleries. 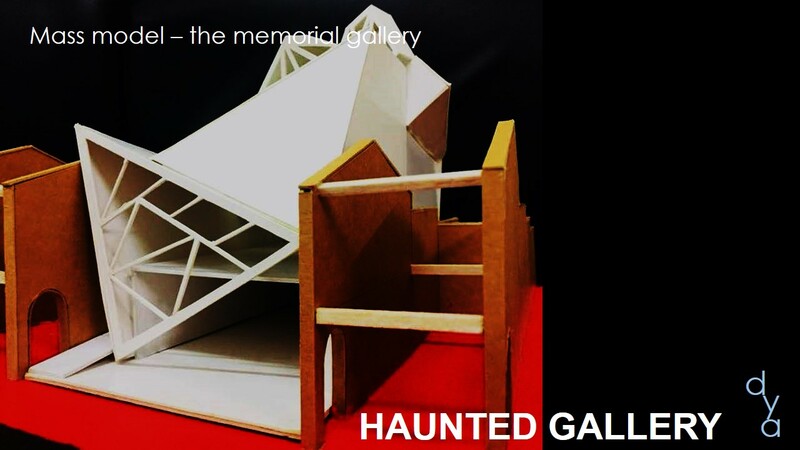 The approach by the actor takes an unusual turn, of first, to deconstruct the very notion of memorial and gallery, second, to reconstruct the memorial or gallery into a form that is no longer common. A common meaning of a memorial can be a statute of a reminder of someone. Memorial taken from the core word, memory is but a non-physical activity of the mind. Therefore, it also reads as a remembrance. Yet, in the current age of nanotechnology memory is but a chip. 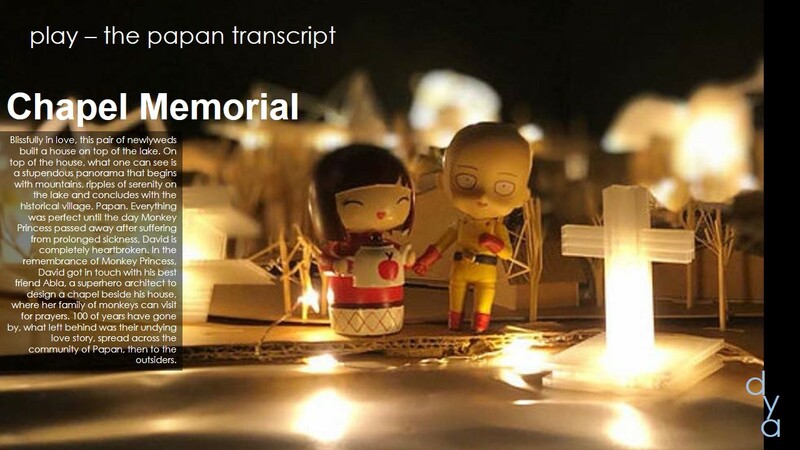 Can a silicon chipset be considered a memorial? Possibility of inserting directly into our brain. 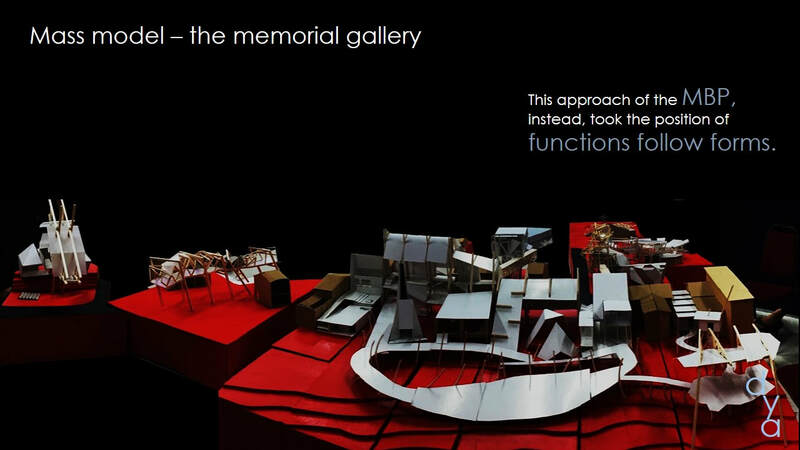 Rather can a memorial, taken from the root word - memo, be a piece of ‘stick-on’ memo? The difficulty in contemplating such discourse arising from the very notion of a signifier of a memorial versus the signified of the memorial. Arising from such, and in contemplation of Wittgenstein’s paradox of “duckrabbit[i]”, a memorial in memory of a self, versus her persona was reconstructed. 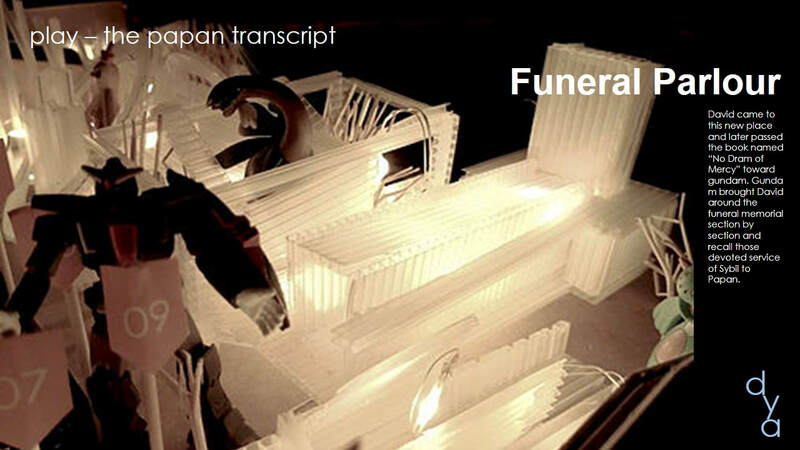 Being the subject matter deceased, we place her in memorial as a funeral parlor. In the absent of herself, we remember her by the Clinique. We froze her ego as a photographic studio. We knew her story from her book and thus immortalized her in a bookshop. We crystalize her pain in a gallery for the MACC[ii]. 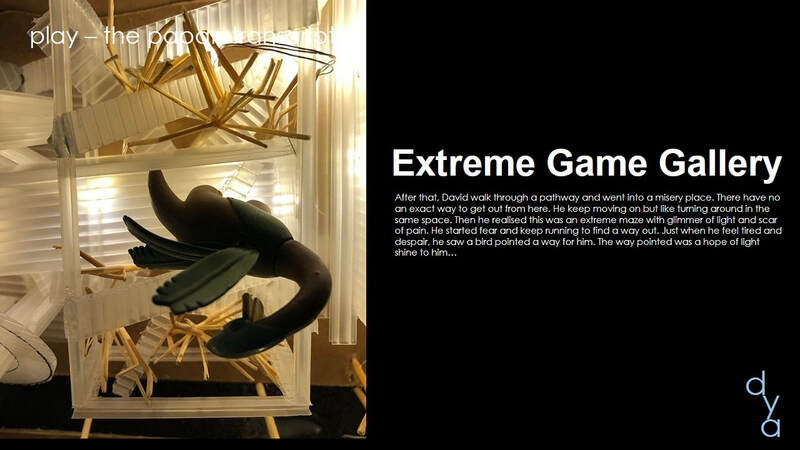 We personified her through the extreme parks. 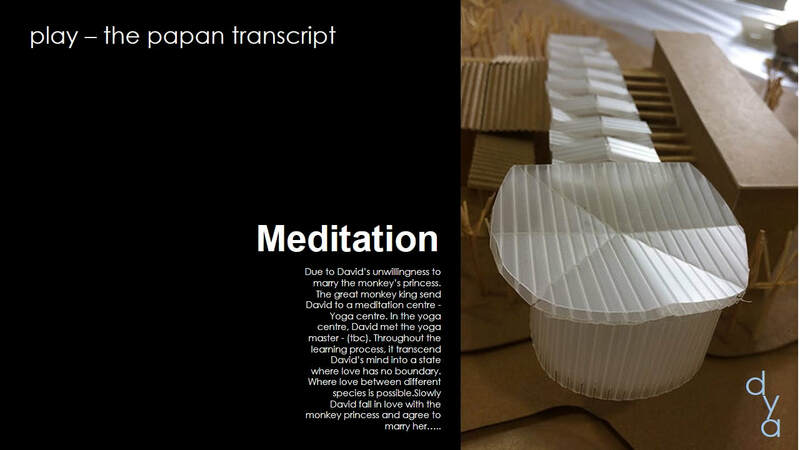 We communicate with her soul through a meditation center. We pray to her, through the chapel of her faith. We embraced her love via the nuptial gallery. So, the remaining question is, these are the functions of which the actors decide to memorialize her. 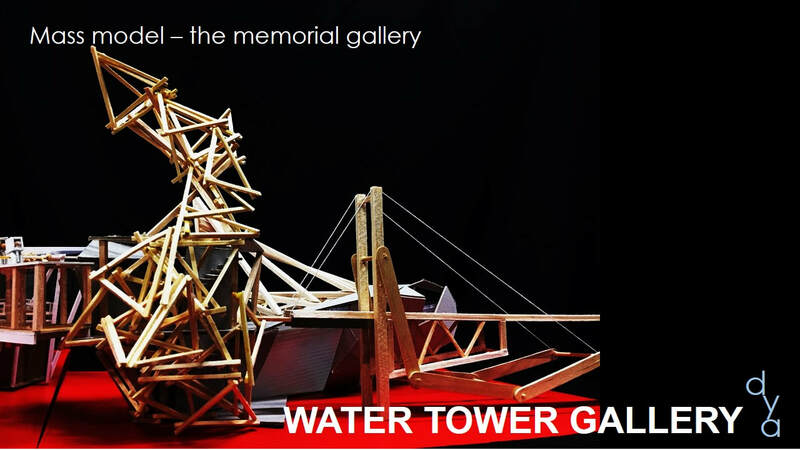 Galleria – A space to display the work of art/artefact. In contemplating the so called space, what stand in-between? Assuming a fish in the aquarium may ask, what is the cat doing outside of the water? By the same token, the cat may ask, why is the fish in the water? A conflicting dialogue between the artefact and the observer and in such case, who is the spectator and who is the showman? Where is the threshold between them? Could it be a point? A vector? A plane? Or simply an object? Or a collective of objects as a matrix? When a point is contemplated, the object/artefact is the observer/subject. Could the object/artefact be observing the subject? But what if an object/artefact has no one observing? Or there is observer but no object/artefact? Perhaps, the object/artefact is the observer. The building containing the object/artefact is the object/artefact itself? The urban scape comprising the building containing the object/artefact is the object/artefact itself? So, to answer how your gallery does takes form, the actors decided to make it inside out. [i] Wittgenstein’s paradox portrayed in the picture of ‘duckrabbit’ first found in the Fliegende Blätter, a German weekly non-political humor and satire magazine, made popular by Wittgenstein in his book. Ludwig Wittgenstein. “Philosophical Investigations”, (1953) republished Wiley-Blackwell (2009). Also see http://en.wikipedia.org/wiki/Rabbit%E2%80%93duck_illusion, accessed 6 July 2018. [ii] MACC stands for Malaysian Anti-Corruption Commission that came into notoriety due to the Teoh BengHock’s death scandal and anything related to MACC thereafter is synonymous to torture. See http://en.wikipedia.org/wiki/Teoh_Beng_Hock, accessed 6 July 2018. This actor decided to immortalize the era Sybil during the Japanese insurgency of Malaya where martial art predominantly was the skill that could have been useful in keeping one alive. 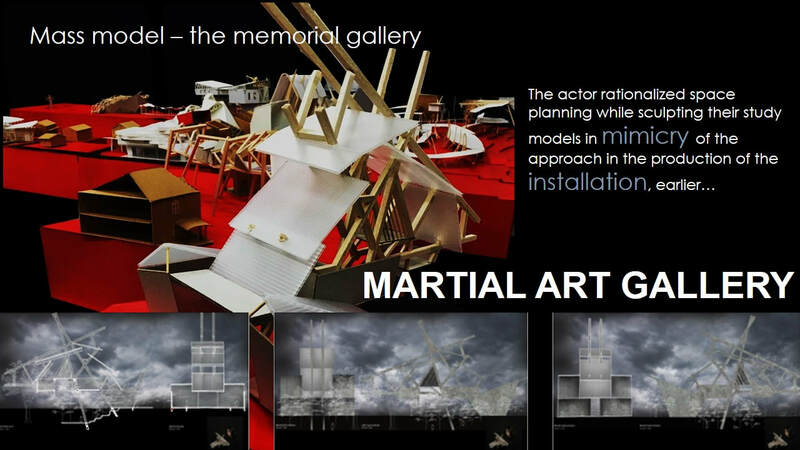 Therefore, the actor consciously place Sybil in memory by proposing the Martial Art Gallery, commonly known as a school of martial art. 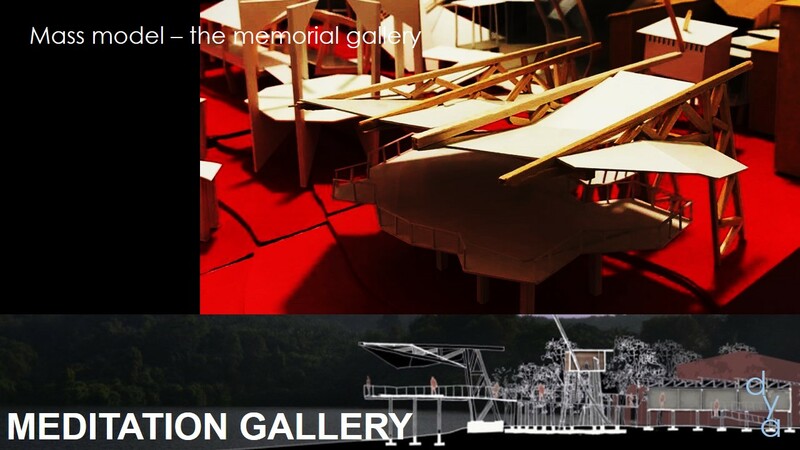 Located at the main entrance of the road to Papan town, this gallery took a position of a landmark, following the 5 elements of Urban Design as proposed by Lynch. The actor employing MBP, produced the mass model in the form of a closed fist – manifesting a fight sequence, with the arenas piled up against one another. Again, employing MBP, the actor emphasized on structure as her main theme to hold the multi layers of martial art arena in position. 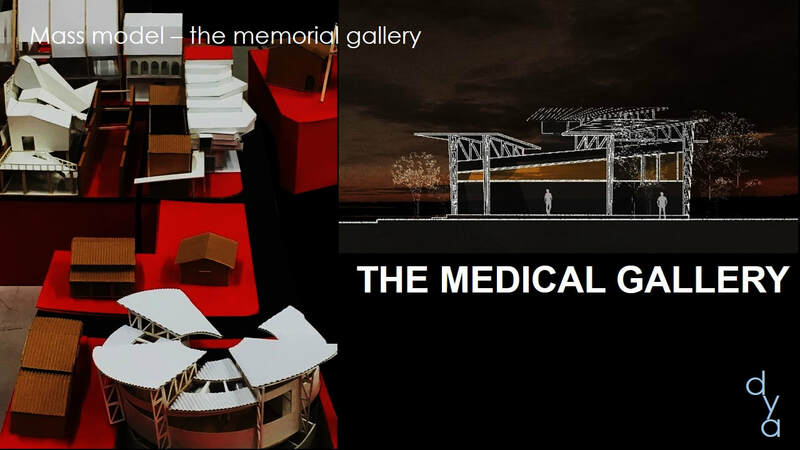 As a result, employing MBP, an exoskeletal building form was produced. The actor further refined such study model into 2D representations as in Plans, Sections and Elevations. MBP has allowed the actor to place form before functions or functions follows form. 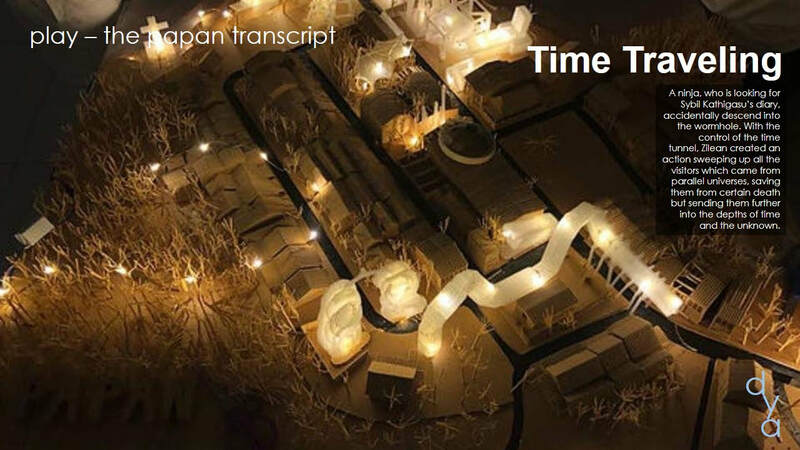 Consistent to the installation’s proposal, this actor decided to immortalize Sybil in memory of her life story as segments/fragments/slides in an array of timeline just liked the space-time continuum, where each slice of space-time, was her story. 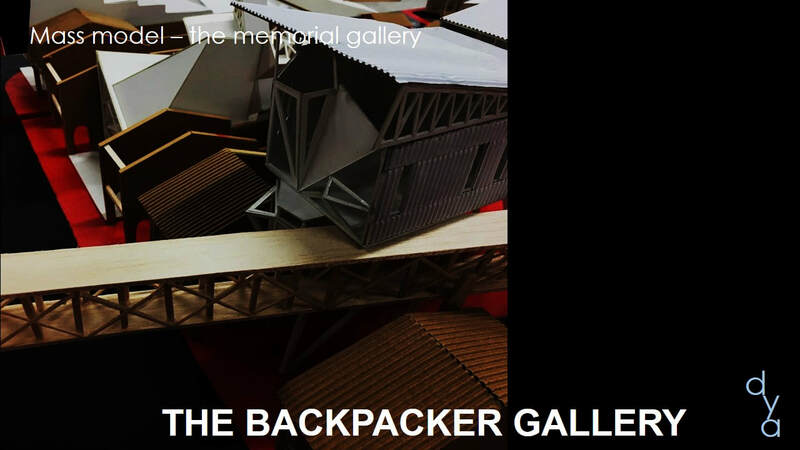 The site selected was above the road itself, so technically the gallery shall be ‘floating’ above the road. The actor adopted MBP by constructing her mass model on stilt. 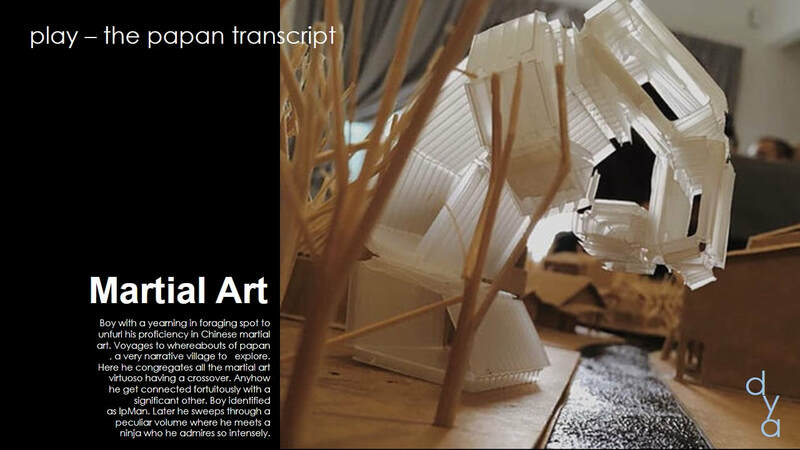 Refining on the mass model, the actor produced a series of structural portal resemblance of the earlier installation. The actor modulated the rhythm of these portal in synced with the modulation of the segments/fragments/slides in an array of timeline just liked the space-time continuum. As a result from employing MBP, an exoskeletal portal building was produced. The form of the building was annexed to the production model the actor employed, in this case, MBP. The actor has therefore, produced a drive through/ walk through gallery and a transitional space. This actor decided to immortalize Sybil in faith through her religion. Therefore, in accordance to the actor’s preferences, there was nothing more meaningful to keep her in memorial but to enshrine her in a chapel to her name. Compatible with the actors interpretation of Sybil as in the installation of a cross taken a page from Baudrillard’s Hyperreal and the Imaginary from Simulacra to Simulation, the actor selected a ‘greenfield’ site with the rear facing a lake with a distance land mass, where the actor could comfortably plunged her ‘follie’ that also happened to be a cross. 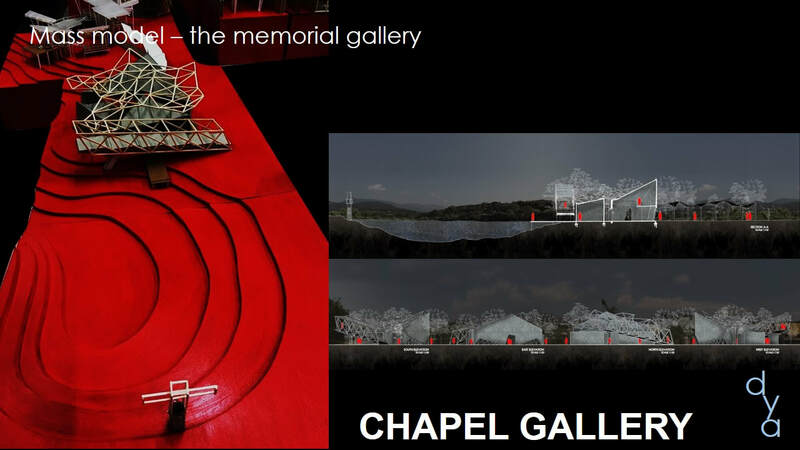 Back dropped against nature, this chapel, employing MBP, the actor refined the massing model into the study model showing the chapel as a stage while the assembly hall was a viewing platform towards the far distance land mass with a cross. The opening premise to this paper annexed to an assumption that in a diverse approach to embark the design studio as both a laboratory and a workshop, the underlying fundamentals are surprisingly common and can be narrowed down to an approach, known as the Production Model, where the 3Ds modus-operandi of Dialogue-Do-Document could be incorporated in every levels of the architectural design pedagogy, with emphasis on employing the Model based paradigm (MBP) – predominantly involving the act of form-making, building up the enclosure element by element, by contemplating the spatial organization in 3 dimensional, as a primary approach to do/produce architecture. 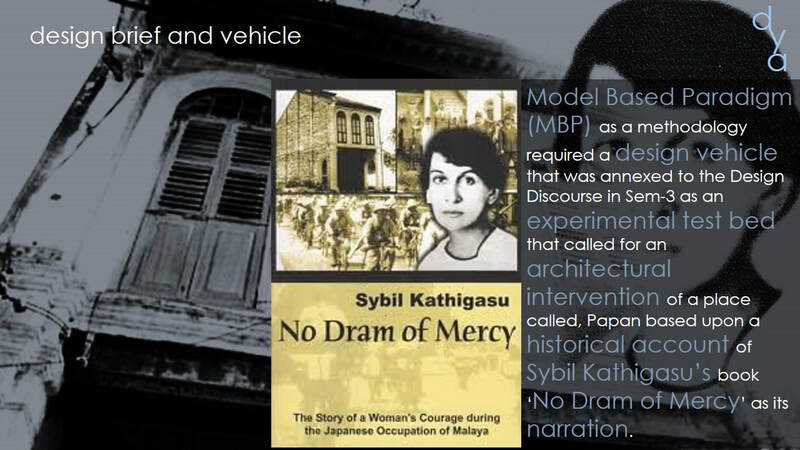 An experiment was construed using the Design Discourse in Sem-3 (in UCSI) as a testbed that called for an architectural intervention of a place Papan in the state of Perak, Malaysia, based upon a historical account of Sybil Kathigasu’s book ‘No Dram of Mercy’ as its narration. 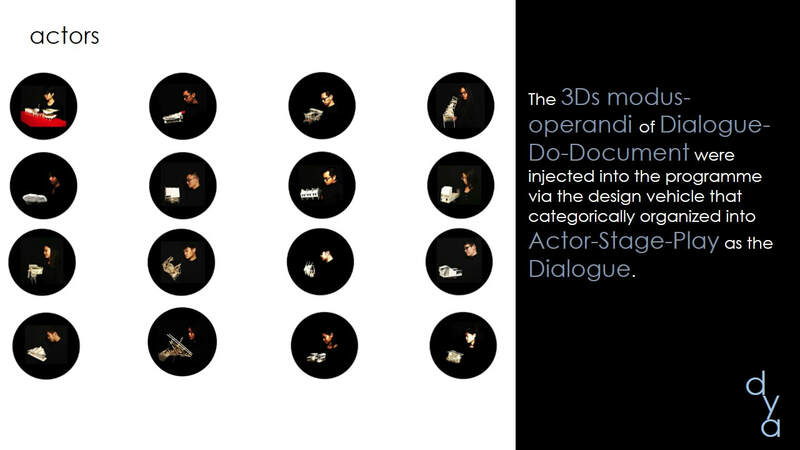 The 3Ds modus-operandi of Dialogue-Do-Document were injected into the programme via the design vehicle that categorically organized into Actor-Stage-Play as the Dialogue. 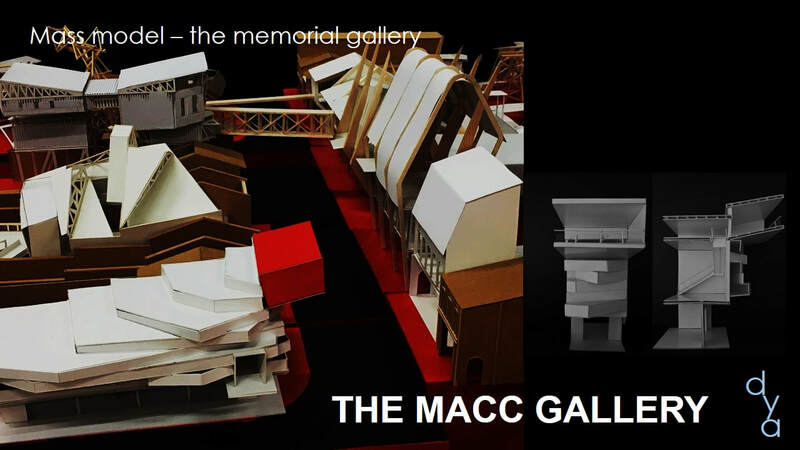 Installation-Mass-Study Models as the process of Do(ing) and in response to produce architecture in the scale of complexity of Artefact-Urban-Building as the Document. In the Actor-Installation-Artefact phase, the experiment revealed that the actors were given a wakeup call from their comfort zone into a philosophical mode of questioning everything beginning from the self in accordance to Jungian psychoanalysis to René Descartes questioning the questioner itself. These set of dialogues propelled critical thinking within the actors before they attempted to embark on the installation, themselves. 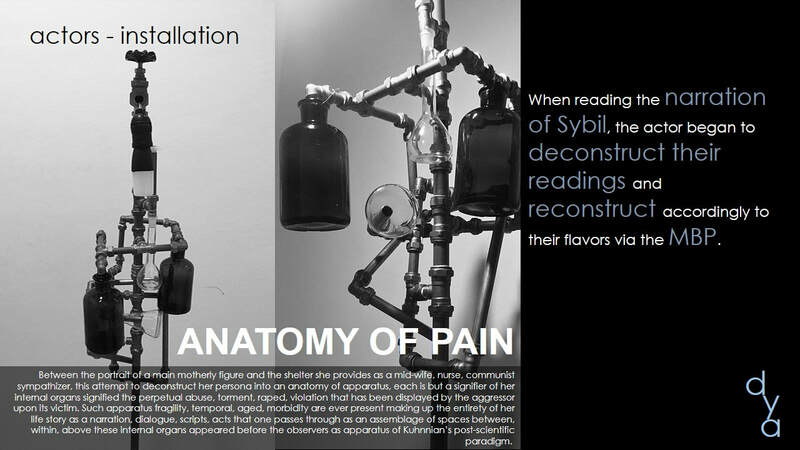 When reading the narration of Sybil, the actor began to deconstruct their readings and reconstruct accordingly to their flavors via the MBP. 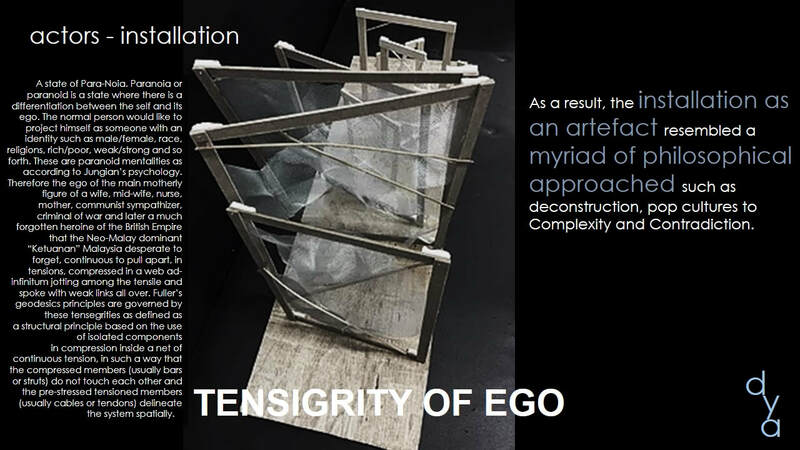 As a result, the installation as an artefact resembled a myriad of philosophical approached such as Derrida’s deconstruction, Baudrillard’s pop cultures to Venturi’s Complexity and Contradiction. 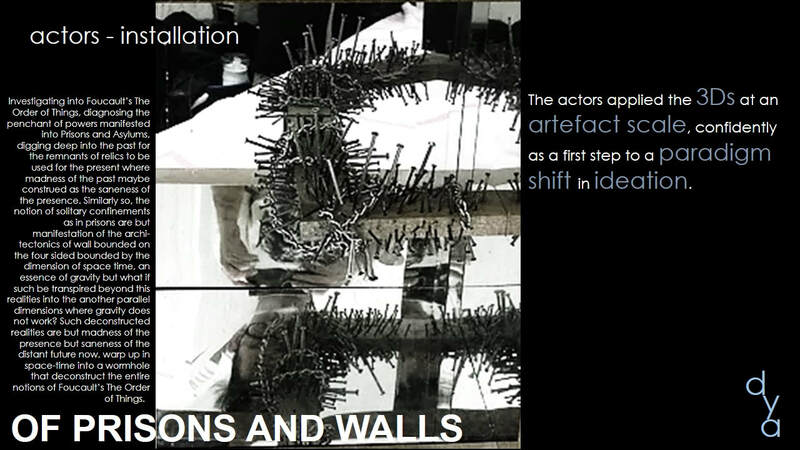 The actors applied the 3Ds at an artefact scale, confidently as a first step to a paradigm shift in ideation. In the Stage-Mass-Urban phase, the actors were placed into a teamwork mode. There is no I – reflecting again into Jungian psychoanalysis of the self, persona and ego. 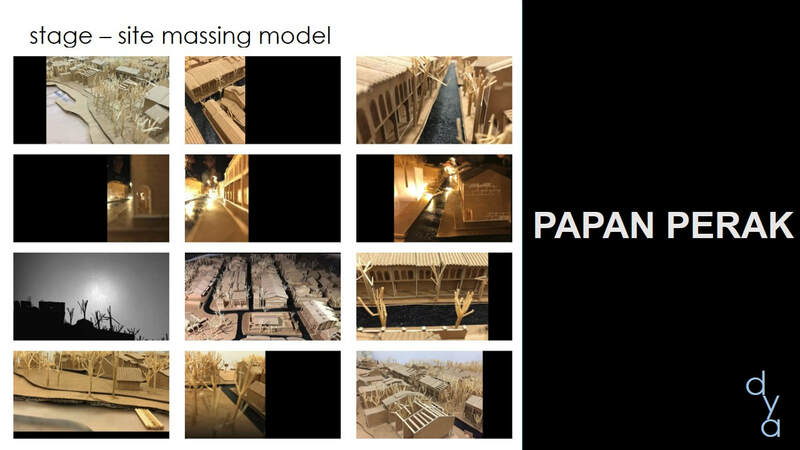 A collective responsibilities entailed the production model into the observation of the site, based on its genius-loci[i] deconstructing the existing conditions and reconstruct into a new interpretation – The Papan Transcript, merging imagination of the surreal into a playful narration comprises of the mass model in ratification of the ruined urban structure on path with Lynch’s 5 elements of Urban Design[ii]. The 3Ds were applied at an urban scale with emphasis on “every building has its own place”. 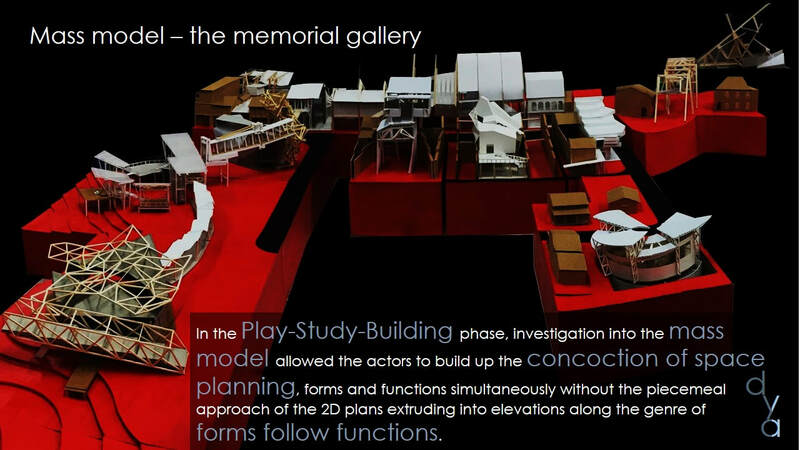 In the Play-Study-Building phase, investigation into the mass model allowed the actors to build up the concoction of space planning, forms and functions simultaneously without the piecemeal approach of the 2D plans extruding into elevations along the genre of forms follow functions. This approach of the MBP, instead, took the position of functions follow forms. 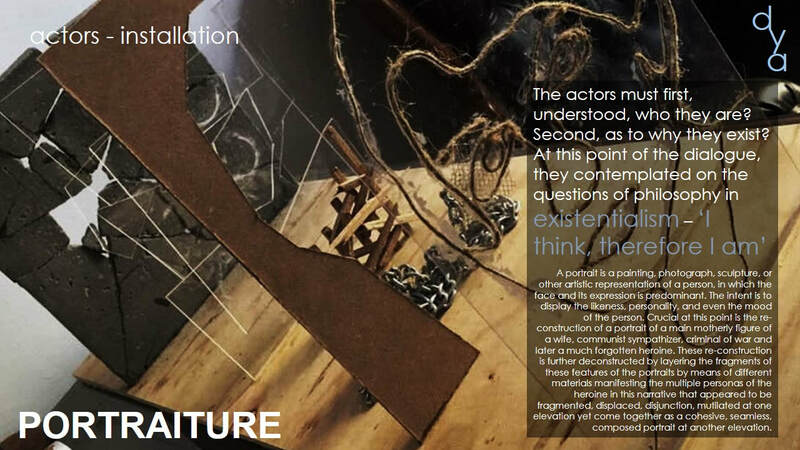 The actor rationalized space planning while sculpting their study models in mimicry of the approach in the production of the installation, earlier. 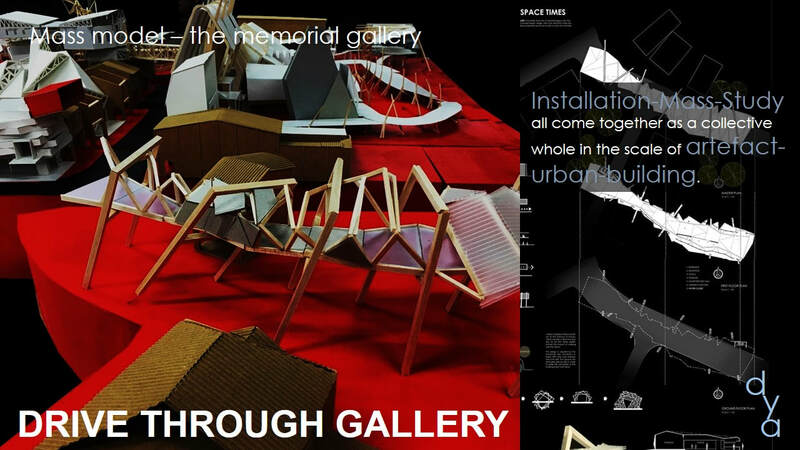 Installation-Mass-Study all come together as a collective whole in the scale of artefact-urban-building. Understanding the semiotics beyond mere representation. 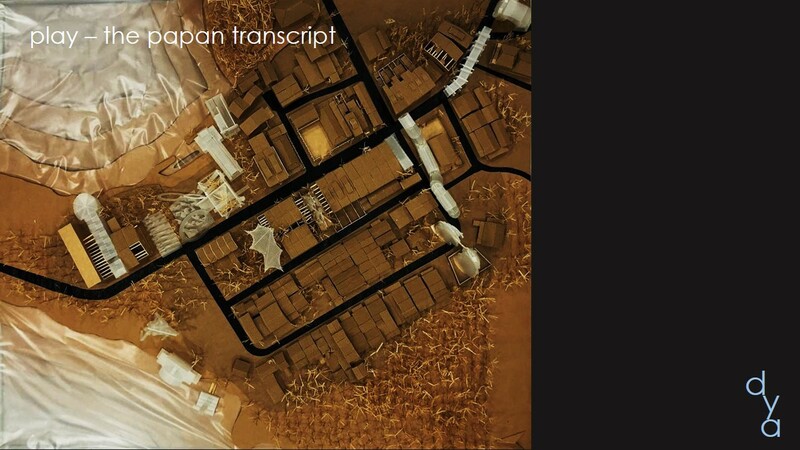 Understanding the notion of Deconstruction beyond just a branch of Architectural Semiotics. 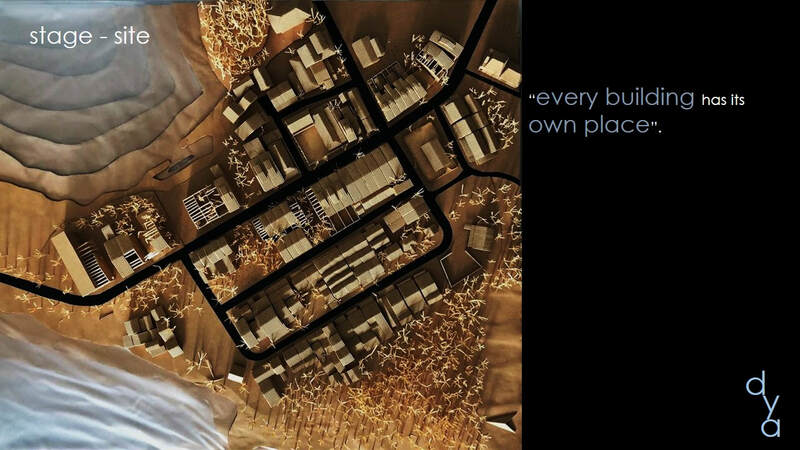 Understanding the purpose of Urban Design, where every building has its place. Understanding the de/re-constructing of the Brief. 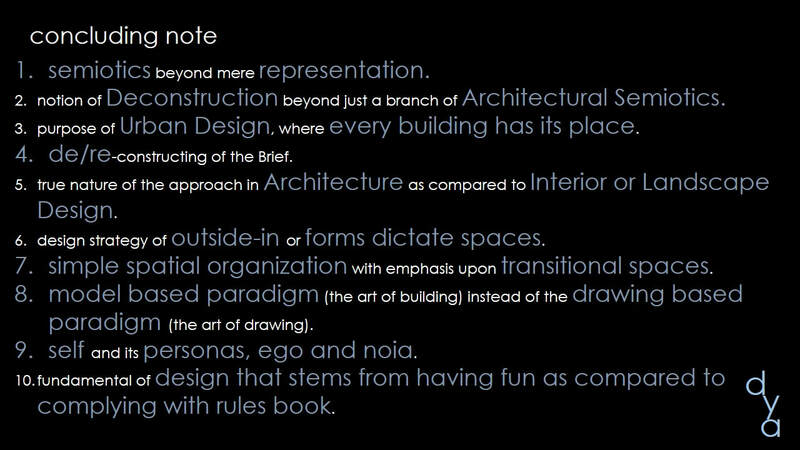 Understanding the true nature of the approach in Architecture as compared to Interior or Landscape Design. Understanding the design strategy of outside-in or forms dictate spaces. Understanding the simple spatial organization with emphasis upon transitional spaces. Understanding the model based paradigm (the art of building) instead of the drawing based paradigm (the art of drawing). Understanding the self and its personas, ego and noia. Understanding the fundamental of design that stems from having fun as compared to complying with rules book. 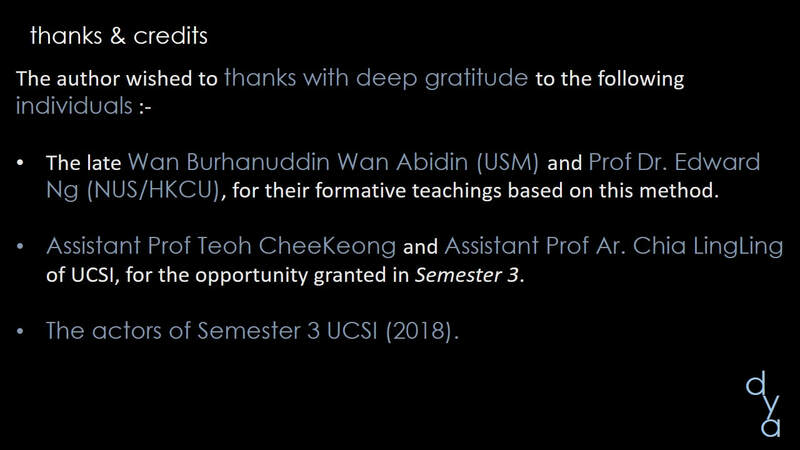 The late Wan Burhanuddin Wan Abidin (USM)[i] and Prof Dr. Edward Ng (NUS/HKCU), for their formative teachings based on this method. Assistant Prof Teoh CheeKeong and Assistant Prof Ar. Chia LingLing of UCSI, for the opportunity granted in Semester 3. The actors of Semester 3 UCSI (2018). [i] Wan Burhannuddin Wan Abidin. 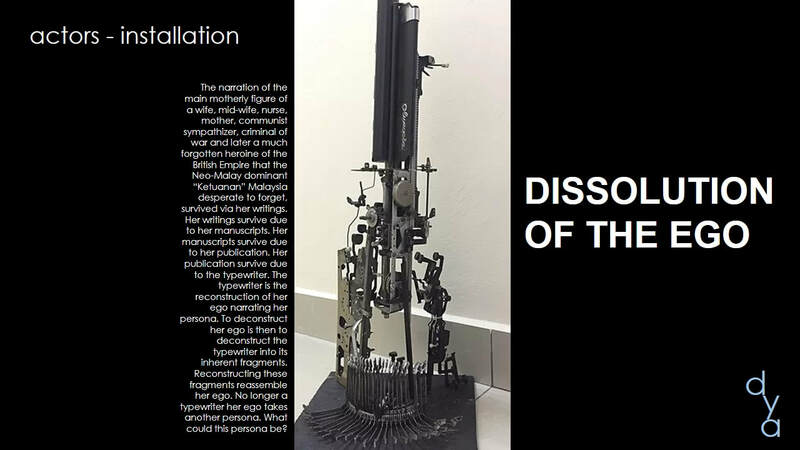 Reader of Design Thesis (Unpublished), by David Yek Tak Wai “The Temple of Contemporary Visual Art Malacca”, USM (1999).